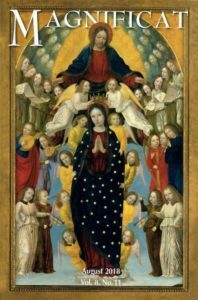 MAGNIFICAT is a monthly publication containing a short morning, evening, night prayer and short daily meditation; as well as the Scripture readings for the Daily and Sunday Masses, essays on the lives of the saints and spiritual insight into masterpieces of sacred art. Magnificat is a good way to learn more about your faith and deepen your prayer life and your relationship with God. The annual group subscription rate is $23.00. That is a savings of almost $24 off of the regular individual price of $47.00. The issues will be delivered to Sacred Heart Rectory, where you will pick up your copy each month. If you would like to be a part of the group bulk subscription, please turn in your payment of $23.00 to the Parish Office or see Fr. Kosch. Checks should be payable to Sacred Heart. The group subscription runs from August 2019 – July 2020. Those in the group may also read Magnificat either online or on their iphone or on ipod.